The Flysky FS-i6 is a fantastic low cost and yet thoroughly capable option for multicopter pilots. If you are building your first multicopter, or buying one of our kits, this radio is a great choice. 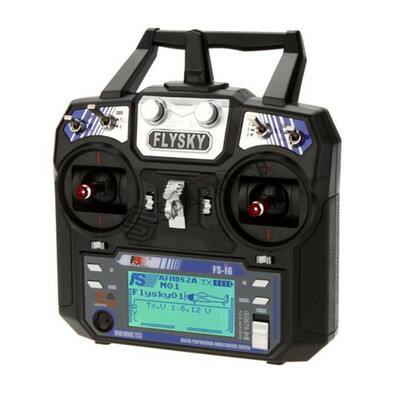 The Flysky FS-i6 is a great entry level 6-channel telemetry 2.4GHz computer transmitter that uses solid and reliable Automatic Frequency Hopping Digital System (AFHDS) spread spectrum technology. The Flysky FS-i6 has both a nice quality look and feel, while the programming is simple to use. The Flysky FS-i6 also has an impressive list of features and includes a 6-channel receiver. The ultra slim case design ergonomically fits your hands leading to less hand fatigue especially during long flights. Digital trims, backlit LCD screen, and simple programming give the Flysky FS-i6 a modern feel with all the features you want. With a low profile antenna, the Flysky FS-i6 is easy to store and no worries about breaking it. Adjustable length sticks, and a loop for attaching a neck strap round out the list of comfort features this radio offers. For changing flight modes or multiple flap position options, the Flysky FS-i6 has a 3-position switch, as well as two adjustable knobs. Expand the capabilities of your models or just know what is going on with the optional telemetry receivers and variety of sensors. Normally you would have to spend hundreds of pounds to get a transmitter with this capability. Not so with the availability of the Flysky FS-i6. For the price, the features the Flysky FS-i6 offers make this one of the best radios available. Entry level 6 channel 2.4GHz radio with telemetry capability. Dual Rate/Trims/Gear/Flap/Gyro Gain Adjust/Flight Mode/Throttle Hold/Hover Pitch Switches. Easy to use Programming & Navigation Buttons. Back lite LCD Screen displays real time transmitter and receiver voltage. Frequency: 2.4GHz ISM Frequency Range. Spread Spectrum Mode: AFHDS 2A and AFHDS. Number of Frequency Channels: 20. Working Voltage: 1.5v x 4 AA. Stick Mode: Mode 2 (Throttle Left). Frequency: 2.4g ISM Frequency Range. 4 x AA Type Battery For Operation.